Situated at the back of our customer’s garden in South Hampstead, London, this Superior Shed is going to be a small 1.8 x 3.4m workshop, surrounded by trees to help dull the sound of his tools. The apex roof on this shed has been covered in our heavy duty felt, which is a thick, waterproof felt with a life expectancy of 12-15 years. 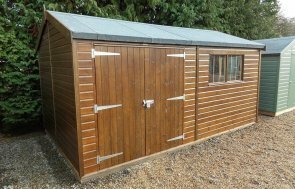 The paint used on this shed is our Sikkens stain, and the colour is Walnut, which fits in very naturally with the customer’s garden. A security pack has also been installed, which consists of a seven lever lock and heavy duty sliding bolt, stainless steel window bars, and security screws for the door hinges, all of which will help to protect the items the customer is going to keep inside his shed. Inside, the customer has got a heavy duty floor to help cope with the heavy equipment that will be stored on the floor (our standard flooring is ex 19mm thick and the heavy duty floor is ex 38mm thick). 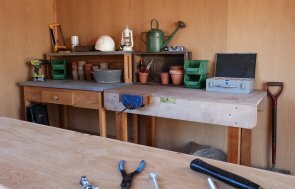 A 1.8m workbench has been fitted under the window in the right gable end, and the customer has opted for our breathable paper lining only, which means that he will line and insulate the building himself further down the line. 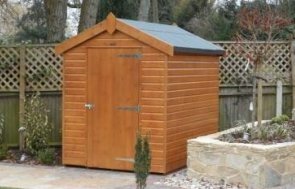 For more information on the features and design options available with our range of Garden Sheds, you can Contact Us online to ask us any questions you may have, or you can call us on 01760 444229 to speak to our helpful team of experts and go through your requirements with you.